Make a to-do list that allows users to enter in and remove items. Your app should remember the items each time your user opens the app. You may want to learn how to use a ListView before trying the challenge! Try your hardest to do this challenge on your own before you read the instructions. Remember, these instructions are just one way the challenge can be solved!. Happy coding! We created an app that allows the user to add things to the list, take things off the list, save the list, and reset the list. This required our screen to have three buttons: one to enter items into the list, one to save the user's items for the next time, and a reset button that will erase the list. Add a label to your screen to tell your user what to do. Add a textbox for your user to enter their to-do item into. Add a button for the user to click once they entered in their to-do item. We renamed this button ‘Enter’ so we can remember what it does when we program our blocks! Add ListView to your screen. This is how the user will see their to-dolist. We set our height and width to ‘Fill Parent’ but you should design your screen however you want! Click here to learn more about how to use a ListView. Add a save button to your screen for saving the to-do list to a database and a reset button to erase the list. We renamed these buttons ‘Save’ and ‘Reset’. Optional: We added two horizontal arrangements to organise our layout, but you can organise your screen however you want! 7. Add a TinyDB from the storage menu. When you drag it onto your screen, it will appear as a ‘Non-visible component’. Our app to displays inputs that the user enters by storing the data in a list variable and then displaying it using ListView. We did this by creating a list variable called items. When our user hits the enter button, we add whatever is in textbox to the list items and display it in ListView. Make a variable called items that will hold your to-do list data. Start the variable out as an empty list since the user hasn’t entered any data yet. Grab a button.click block for your enter button. Get an add items to list block from Lists. Put it inside your enter.click event handler. Put items for the list name and TextBox1.Text as the item to be added to the list. Grab the set ListView1.Elements to block and put it underneath the add items to list block. Add your items variable to the set ListView1.Elements to block. Optional: To make our app easier to use we hid our keyboard when the user pressed enter. To do this, click on TextBox1 and grab the TextBox1.HideKeyboard block. See if what you built so far is working! Hook up your phone or emulator and test your app. When you type things into the textbox and press enter they should appear below in the ListView. If your app is not working, go back and and look for errors to fix before moving on. Reach out to your mentor or teammates if you are stuck. Our users can delete something from the to-do list once they've completed the task or no longer want it there by clicking on it in ListView. We did this by creating a variable called index. This is local variable since we only needed to use it in one place in the code. We set the variable index to be the index of what the user selected in the ListView. Then we used index to tell the app what to remove from the list items. After ListView is updated since the list items has changed. Create a local variable called index and set it whatever you like to start out. We set our to zero. Get the set ‘name’ to variable block and set it to the variable index. Attach the block that says index is list, thing, list. Assign thing to be ListView1.Selection and the list to be the items list. Grab the remove list item block and put inside your local variable block. Set your items variable to be the list and your index variable to be the index. Place the set ListView1.Elements to block below your orange variable block and connect your items variable to it. Time to see if your app is working! Hook up your phone or emulator and test it out. When you use your app you should now be able to touch on the items you have entered into your to-do list to delete them. If your app is not working go back and check your code. Try looking at some ListView tutorials or reaching out to your mentor or teammates if you are stuck! To make our app easier to use, we added a reset button that clears all entries out of the to-do list. We programmed our reset button to change the list items back to an empty list when the user hits it. Then, we updated ListView to display the new empty contents of the list items. Grab when button.click block for your reset button. Attach a create empty list block. Grab the set ListView1.Elements to block and attach the get items variable block. Make sure your reset button works! Hook up your phone or emulator and test it out. After you put entires into your to-do list you should be able to hit reset and to clear the list. Reach out to your mentor or teammates if you are stuck. When our user closes the app, the to-do list is saved for the next time. We programmed our “save” button to call our database (TinyDB) and save the items list. The database remembers the user’s to-do list exactly how it is at that moment and keeps it there for the next time. Grab the when when button.Click block for your save button. Add the call TinyDB1.StoreValue block. Add your items variable to valueToStore. Our app checks the database when it starts up to see if there is any previously saved to-do lists. To do this, we used the when Screen1.Initialize block, which will run when Screen1 starts up. We set our list items to whatever is in the database under the tag name "ListData". If there is no stored data, we told our app to create an empty list, or a blank to-do list. 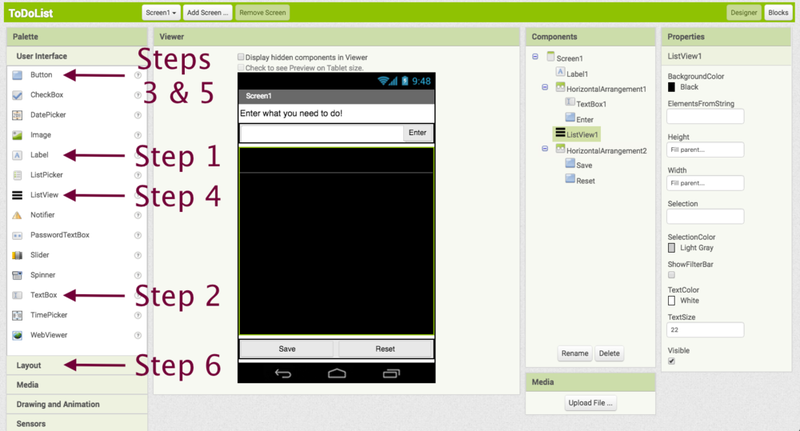 After that the app display whatever is in the items variable which is now either stored data or an empty list. Grab the when Screen1.Initialize block. Grab a set ‘variable name’ to block and set the variable to be your items list. Call the database using the call TinyDB1.GetValue block. Enter the tag name you used to save the list for the tag. Put the create empty list block for valueIfTagNotThere. Grab the set ListView1.Elements to block and attach it to your items variable. Time to see if your app is working! Boot up your app and put some entries into your to-do list. Hit your save button and close out of the AI companion app on your phone or emulator. Open the app back up and see if your entries are there. If they aren’t, go back and make sure you don’t have any errors in your code. Make sure you tag names match exactly including all capital letters. If everything is working you’ve completed the challenge! Congratulations! Still stuck? Download our source code. Here are instructions on how to download and use source codes.